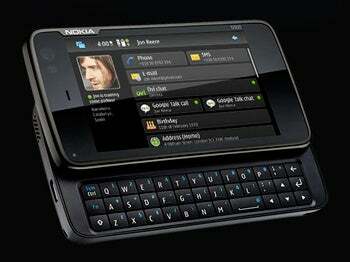 After several unofficial leaks, Nokia on Thursday officially unveiled the N900, the company's first Linux phone. It's a good first step to rejuvenate Nokia's smartphone line, but will the N900 have what it takes to go head-to-head with the iPhone and Android Phones? The Nokia N900 has some powerful guts. The device packs a powerful ARM Cortex-A8 processor and has 1GB of memory for running applications. The N900 also features OpenGL ES 2.0 graphics acceleration, opening a window of opportunity for high quality mobile games. The N900 runs on the new Linux-based Maemo 5 software, which Nokia says "complements" other software platforms from the company. Recent rumors had Nokia dropping Symbian in favor of a Linux based platform, which many speculated to be Google's Android. But the Maemo software is nothing new to Nokia. The company's previous Internet Tablets (three to be exact) also ran on various Maemo versions. Still, the new big thing in the N900 is phone capability, which the older tablets were lacking. The N900 serves as a quad-band GSM/EDGE, 900/1700/2100MHz UMTS/HSPA phone. The N900 does handle connectivity well: next to the GSM and HSPA antennas, the new device features WiFi, GPS/A-GPS, an FM transmitter, Bluetooth 2.1, and TV-out capabilities. Not too shabby, considering it also comes with 32GB of on-board storage, expandable up to 48GB via micro SD cards. Just like the iPhone, the N900 has a 3.5-inch display, but unlike Apple's phone, it doesn't have a capacitive screen, meaning that more pressure is required for the display to acknowledge your commands. On the upside, the N900 has a higher-resolution display (800x480 pixel), placing it among other high-res screen phones such as the HTC Touch Pro 2 or the Samsung Omnia II (see comparison charts). 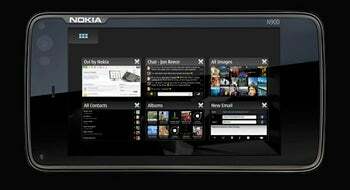 The Nokia N900 also promises desktop-grade Web browsing, with the bundled Mozilla-based browser, which happily has Adobe Flash 9.4 support. In comparison, there's no word of Flash coming on the iPhone. Flash support is on the way for Google Android and BlackBerry phones, (except the HTC Hero, which already has full support). Nokia's N900 features a 5-megapixel camera with Carl Zeiss optics and dual-LED flash. By comparison, the iPhone 3GS has a 3-megapixel camera and no flash. The Android-based HTC Hero has a 5-megapixel camera, but no flash. The Palm Pre on the other hand, has 3-megapixel camera with LED flash. The Nokia N900 has also another advantage -- a full QWERTY slide-out keyboard, scoring along the Palm Pre, the Nokia N97 and the HTC Touch Pro 2 in this category. There are also a couple of Android-based Motorola phones coming out next month, which will feature a full QWERTY keyboard. But most likely, the software on board of the Nokia N900 will decide the phone's faith. The Maemo 5 operating system looks promising in early previews, but the apparent lack of an application store could handicap the device prematurely. And last, but not least, Nokia said the N900 will cost just over $700 (unsubsidized and unlocked), so if T-Mobile or AT&T decide to carry the N900, hopefully a hefty subsidy will be put in place.